Freedom and Flourishing: Can democracy protect liberty? In January 2011 I wrote on this blog about my personal conviction that liberty is necessary to human flourishing because individual flourishing is an inherently self-directed process. That led me to ask where the greatest challenge to liberty comes from. I came to the conclusion that the greatest challenge to liberty comes from people who do not mean anyone any harm – people who live among us who want us all to have happier lives. These people threaten liberty because they use their democratic rights to support policies that involve governments acting as guardians of the well-being of citizens – even to the point of protecting individuals from making bad choices - rather than for protecting their right to live as they choose. I saw the political choices my fellow citizens were making as a threat to liberty. Now, wind the clock forward to the beginning of this month, when I asked myself: ‘What is the greatest threat to human flourishing?’ My answer: the failure of democracy. In my view the greatest threat that people in high-income countries face over the next few decades is that democratic governments will not be able to cope with the increasing demands that seem likely to be placed upon them. In my view this would have adverse flow-on implications for human flourishing in other countries. If I see current trends in democracies as a threat to liberty, why should I see risks to democracy as a threat to human flourishing? 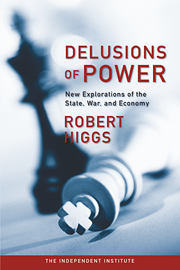 When you start asking yourself questions like that it is probably time to read Robert Higgs’ new book, ‘Delusions of Power’ (synopsis here). Higgs encourages people to go back to first principles in thinking about the role of government. James Madison’s famous passage about neither government, nor external or internal controls on government, being necessary ‘if men were angels’ is an enormously seductive instance of question begging. Recognition of human fallibility does not establish that individuals would voluntarily choose to submit to the authority of the state rather than to remain in a stateless condition. Mancur Olson’s claim (in ‘Power and Prosperity’) that anarchy ‘increases the incentive to steal and to defend against theft, and thereby reduces the incentive to produce’ could be true relative to the ‘nirvana’ benchmark of ‘an appropriate peaceful order’. In the real world, however, there may actually be less incentive for productive effort under a state, because, to use Higgs’ words, it is ‘a standing invitation to (legal) theft for all who can gain a grip on any of its many levers of power’. The evidence of history shows that the belief that it is the role of the state to defend the individual’s right to life, liberty and property is closer to wishful thinking than a description of how states have actually functioned. Some major political decisions in the United States – such as involvement in the First World War and the expansion of federal government responsibilities during the great depression – were contrary to the political platforms of the presidents concerned in the preceding elections. During war times and other crises, governments are given strong public support to impose many restrictions on freedom that would not be tolerated during normal times. Having tolerated them, however, many people may come to regard them as normal or even desirable. This is the basis for a ratchet phenomenon where expansion of government during a crisis has not been fully reversed following a crisis. ‘We also need to consider the likely outcome if our society has no state, but another society does, and that state has the capacity to harm us greatly and, for whatever reason, seeks to do so. I am not convinced that this particular problem is insoluble, and, indeed, I believe that the states defenders have blown it out of all proportion, but I do not dismiss it entirely’. If I try hard enough I can imagine circumstances where coercion by the state might wither away so that, eventually, somewhere in the world, citizens will one day opt to establish some kind of libertarian utopia to replace democratic institutions. Perhaps experiments with charter cities might help this process. It would be possible, even in a modern society, for the useful functions of government to be performed by private contractors and voluntary organizations. I don’t know how such a society would overcome free-rider problems arising from provision of some public goods, but coercion associated with tax collection might not be an essential characteristic of all societies for all time to come. So, why do I see the failure of democracy as a threat to human flourishing? The failure of democracy that I am concerned about seems unlikely to result in its replacement by superior institutions. In many instances, the institutions of representative government may actually remain in place, but they will have become completely meaningless. We can already see some signs of this failure beginning to emerge. Some political leaders seek to win popular support by using focus groups to help them develop nice-sounding but meaningless slogans, rather than seeking to gain support for policies to underpin future economic security. Governments that have already taken on more responsibilities than they can cope with are constantly pressured to accept additional responsibilities. The right to vote has already become hollow in some countries in Europe. It is difficult for voters to punish political parties for past errors when the major parties all share responsibility. All options available to voters become unpalatable when democratic governments are burdened by excessive debt. In some countries the institutions of democracy are likely to come under threat as a result of rioting and other forms of public disorder. Democratic governments may be replaced by authoritarian regimes that have less regard to economic security or citizen’s rights. It is possible that members of such governments might have a greater interest in restoring economic freedom and expanding opportunities available to citizens than in self-enrichment, but there is no a priori reason to expect that to be so. The only certainty is that the new leaders will be more difficult to remove from office than democratically elected politicians. In the end, it seems to me that there is no inconsistency between viewing recent trends in democracy as a threat to liberty and viewing the increasing risks to democracy as a threat to human flourishing. Some of the institutional changes that are needed to discourage democratic governments from taking on more responsibilities than they can cope with will also reduce the threat to liberty. I think Robert Higgs is on the right track in suggesting the need for changes in the machinery of government to make it more difficult for ill-considered and poorly justified measures to be adopted during a crisis. It would also be useful to consider what institutional changes might enable some future crises to be avoided. Perhaps democracy could protect liberty. Hello Winton - nice post! One of the things I'm quite taken with in terms of renewing/reinvigorating democratic states is the concept of a 'sunset clause' on legislation. But I don't mean all legislation; more perhaps the establishment of an absolute right of any parliamentarian to nominate that a piece of legislation is to contain either a 'review date' or even an expiry date. This would not be subject to a vote; I mean it to be an absolute right to nominate that such a clause be included. I see this as a means whereby, should a change of government occur, the incoming government is bound to at least consider the need for perpetuating its predecessor's legislation - and hence is joined into accountability for the continuation. Perhaps you could even involve citizens' referenda in the process, whereby, if a significant portion of the electorate (say, a petition equal to two thirds of the present government fptp mandate) demanded a piece of legislation be reviewed, it must be re-considered in the current parliamentary session? Anyway, just thoughts you provoked on a wet and windy Sunday - and thank you again for the post. kvd: I like the idea of sunset clauses. I wonder how it would be possible to introduce changes of the kind you have in mind. There is a legal question - I'm not sure whether it can be done by just passing a law. Even if it can be, you would need bi-partisan support to ensure it wasn't just repealed by the next government. So, that makes me wonder what rules would be more likely to obtain support of the major parties. Perhaps some kind of automatic sunset a decade ahead for some classes of legislation - perhaps defined by a parliamentary committee - might have some chance of acceptance. I might take a look at how sunset provisions operate elsewhere in the world.